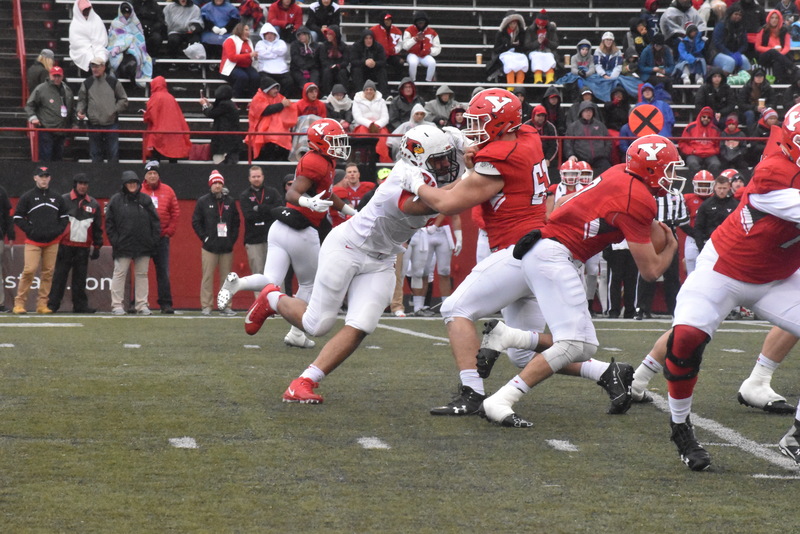 The Youngstown State University football team (3-5, 1-4 in Missouri Valley Football Conference) entered a rainy Stambaugh Stadium on Saturday looking to bounce back from a three-game conference losing streak. The Penguins had won three of the last four matchups against Illinois State University (6-2, 4-1 MVFC) at Stambaugh Stadium. 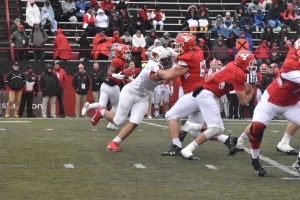 However, YSU was unable to keep its playoff hopes alive and fell to ISU 35-0. It was shutout for the first time since 2008. YSU started the game on offense with quarterback Nathan Mays under center but were held to a quick three-and-out possession. The Redbirds found success on the ground in the next drive. Running back James Robinson ran it in from 11 yards out to cap off a 9-play, 72-yard drive that put ISU up 7-0 with 9:51 left in the first half. ISU ran for 62 yards on that possession. On the first play of the ensuing Penguin drive, Mays was hit by linebacker Tyree Horton and fumbled. Defensive tackle Matt McCown snagged the loose ball out of the air and returned it 26 yards for a touchdown. YSU found itself in a 14-0 deficit with 9:06 left in the first. McCown’s score was the first fumble recovered for a touchdown against the Penguins since 2012. Ricky Davis took over at quarterback after the fumble from Mays. The score remained 14-0 in favor of the Redbirds at the end of the first. The Penguins had six yards of total offense and didn’t reach a first down in the opening quarter. Mays checked back in at quarterback to start the second quarter but YSU was held to another three-and-out possession. A 10-yard pass from Mays to tight end Kevin Raider picked up the first YSU first down of the game halfway into the second quarter. The Redbirds ended the first half with another score. Running back Markel Smith broke two tackles and found the end zone on a 1-yard run that increased the ISU lead to 21 with 9 seconds left in the second quarter. 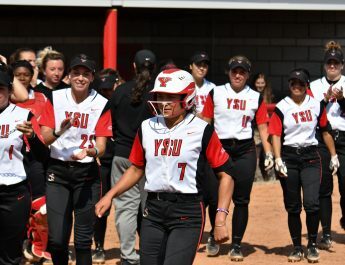 YSU trailed 21-0 at the end of the first half. ISU led the game with 188 yards, 168 of which were on the ground. YSU had 32 total yards in the first half. The Penguin defense brought some energy into the second half and held ISU to a three-and-out on the opening drive. Ricky Davis was brought back in at quarterback for the second time on YSU’s first offensive possession of the third quarter. YSU avoided disaster early in third quarter when ISU went to the wildcat formation. Wildcat quarterback Malachi Broadnax missed a wide open receiver on what would have been a sure touchdown. However, the drive was extended when the Penguins were called for defensive holding. The Redbirds made YSU pay for the penalty a few plays later when Robinson punched it in from two yards out for his second touchdown of the game. ISU led 28-0 with 9:01 left in the third. YSU looked to answer as the Penguins marched down the field on a methodical 11-play, 59-yard drive. The hits kept on coming as a pass from Davis to wide receiver Alvin Bailey was intercepted in the end zone by cornerback DraShane Glass. The Redbirds continued to pour it on in the fourth quarter after a fourth-down conversion set Robinson up for his third rushing touchdown of the day. ISU led 35-0 with 12:50 left in the game after the 3-yard run. 299 of the 341 yards for ISU were gained on the ground. YSU ended the game with 147 total yards on offense. Both Smith and Robinson had over 100 yards rushing for the Redbirds. The Penguins will move on to face Indiana State University on the road next Saturday. Kickoff is scheduled for 1 p.m.